The Boho Hobos: Losing Hope? Well, if you’ve been keeping up with my posts, you’ll know that we have gone off the road. We found a cute house in the mountains to rent, and we’re going to put “Hope” in storage today (we can’t get her up our new driveway). If you’d like to read more about why the heck we would ever do such a sad thing…you can read about that decision HERE. I’m trying to not be depressing as I write this…I really am. But you have to realize how incredibly attached to our little home on wheels that we were. I’ve met a few people that have thought we’re absolutely nuts to live in an RV. I truly feel sorry for them. They will never know the incredible feeling we’ve gotten out of living in such small quarters together. Hope brought us closer in every way imaginable. We learned to value and respect each other on such a deeper level. We learned each others boundaries. We learned to love on a whole new level, too. When you’re angry or upset with someone…and you literally can’t run away from them, it forces you to work on your relationship. It taught us to face our fears head on and not run away from them. It strengthened our marriage and our bonds with our girls. For that, I am truly grateful. Some people thought we were poor, or that we lost our “real” home, or all our money, or whatever crazy things I’ve been told. Honestly, we just wanted to be with Daddy as he worked all over the country. We were sick and tired of being separated from him…sometimes months at a time…and one time, he was gone a whole year. 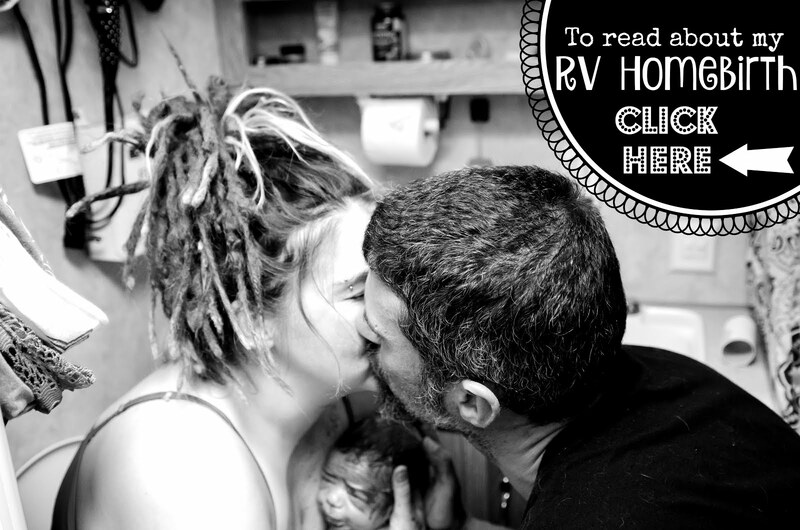 I have a bit of gypsy blood in me (not literally), so when Nic joked that we could always move into an RV to be with him, I jumped on the idea…that was over 2 years ago when we made that decision. It feels like it was only yesterday though. Six months later, we had found the perfect RV for the 4 of us (and 2 cats). Nic flew out from Virginia to buy it with me, we took it to my in-laws, he and I began working on it immediately, and a week later, he flew back out. I spent the next 2 months fixing it up with a little help here and there from some friends and family. On Mother’s Day in 2013, a family friend hauled it up to the mountains for me and the girls and I began our fulltime journey without Daddy. It was exhilarating, liberating and absolutely terrifying all at once. I was on my own, and I hadn’t the slightest clue about anything RV related…but I learned…REAL QUICK. Haha. A month later, Daddy flew out, we bought a truck, and on June 11th, we began our Fulltiming journey together as a united family…never to be separated again. I spent these past 2 weeks of living in Hope in my in-laws driveway, packing up our belongings. We had sooooo much stuff in there. Part of me thinks we were overweight…but then again, it IS a Toy Hauler. Technically, we could put about 3,000-4,000 pounds of crap in there…and there’s NO WAY we had THAT MUCH stuff. Nevertheless, I had quite a bit of work ahead of me, and with Nic at work in the downtown office, and two little girls content to play all day with their Grandparents, I was on my own. But that’s ok. It gave me the time I needed to say goodbye. It’s exactly how it all began. Just me and my RV. I packed and packed and packed. I tried not to cry. Instead of seeing the sad side of things, I tried to remind myself of the good things around the corner. Instead of missing our books all crammed into cupboard after cupboard, I tried to have peace in knowing that soon, we would have a room solely devoted to Homeschooling…and all our books. I could have our library back. As I removed my Boho decorations, I tried to remind myself that soon, I would have a new space to decorate. I love interior decorating…as most of you know. It would present me with a new challenge. A challenge I looked forward to embracing. I would have a LOT of wall space and not much to decorate it with…yea, it was definitely going to be interesting. As I disassembled furniture, removed decorations, and boxed up all the materialistic things that we held dear, numerous memories came flooding back to me. Memories of building all that furniture together with my Husband…usually sweating to death in the hot Virginia or Arizona sun…and hoping we weren’t angering our neighbors with the loud noises of our power tools. Memories of renovations and remodeling projects. Building bunk beds twice. Memories of bedroom swaps, toys everywhere, and little girls running up and down the hallways screaming with delight. Don’t even get me started on all the memories of seeing new things, making new friends and experiencing new places. I hope beyond all hope that our girls remember these wonderful times for the rest of their lives. The little one probably won’t, but I hope the oldest one does at least. Everything was so tiny, so cramped and so miniature, but the love, happiness and peace was vast. Some may see an empty RV, but I see endless opportunities, joy everlasting, and true, unadulterated Freedom. …just one of the many projects I undertook and taught myself how to achieve. See. My RV taught me to trust and push myself out of my comfort zone. There were so many things I didn’t know how to do or use before she rolled into my life. Forced smiles…except Cindy. She doesn’t mess around.. She’s REALLY mad to leave “her RV”. But, she doesn’t yet realize she’ll have a big house to run around in either. Not that that really matters. A house doesn’t make a home. Ugh. This post is really depressing. I’m sorry. I’m trying to remain optimistic. I really am. I just worry that after being so close together, the large space might work to obtain the opposite of what these past 18 months have given us. I have to remind myself that everything happens for a reason and that everything will be ok. If there’s one thing I love just as much as my RV…it’s being in the Mountains. So it’s not ALL bad. Pretty soon I’ll be living in those gorgeous beauties, absorbing their spiritual energy and breathing their fresh mountain air. We got her to her new place in a nice RV storage facility. We winterized her and bid her farewell…for who knows how long. Until we meet again…you beautiful tin can on wheels. Thank you for every single thing you have given and taught us. These have been the best 18 months of our lives, and we owe it all to you. When one door closes, and another door opens, you should probably get outta there. Your house sounds haunted. Seriously though, it’s time for a new chapter to unfold. I’m just not sure if I should be writing it on this blog?